March came in like a lion, but went quickly to a lamb. I love March! I love to eagerly watch for flowers and bulbs to make their appearance and the newborns out in the fields. 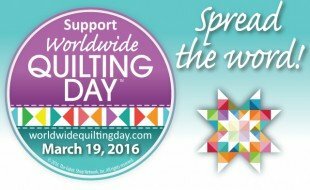 March is even more special because it is National Quilting Month with Worldwide Quilting Day being on March 19th. 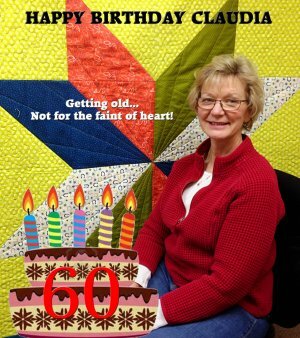 Come celebrate quilting with us all month and especially Saturday, March 19. We promise to inspire you! We will have a huge selection of books and patterns on sale for 60% OFF. Thread is also what binds us and our quilts together; therefore, all of our threads will be 20%-50% OFF. Also, for all other items in the store, receive 20% OFF on purchases over $60.00. Be sure to SAVE THE DATE! March 19th is also my 60th Birthday and I look forward to beginning my 6th decade. I AM asking for a gift please. I would like one or more 9.5-inch friendship star blocks. The instructions will be at Patchwork Quilts and posted on our website. The reason why I am requesting "blocks" is because I would like to use them to make quilts for our Veterans. The background must read blue and the star must read white (a good way to use up some scraps). Feel free to embellish them however you would like. I plan on putting my Dad's name in the center of mine and John’s father’s on his. I am so proud that they were veterans of WWII and the Korean War, respectively. So have fun and bring them in on March 19th or anytime in March. We’ll have a big cake with lots of candles on it for my birthday celebration, so stop in for the party. 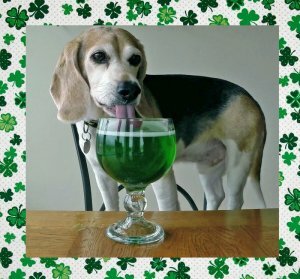 To celebrate St. Patrick’s Day, all our Lucky Banner Kits and Panels will be 40% OFF. 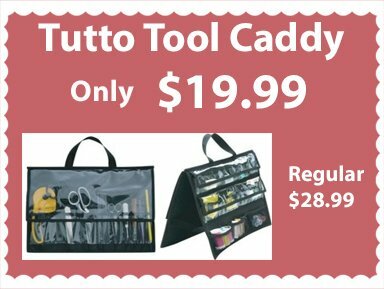 Our Weekly Steal of a Deal features a really cool Tool Caddy from Tutto. Keep all of your sewing tools at your fingertips with this self-standing easel tool caddy. It has versatile pockets on both sides to organize your tools. What a great companion to take to classes or retreats. This deal will continue through Saturday, so stop in while supplies last. 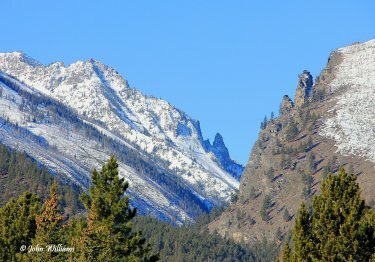 Beginning tomorrow, our website will feature dozens of John’s beautiful photographs from our Bitterroot backyard. “Today’s Montana Photo” will showcase photos from John’s recent hikes up Mill Creek and Blodgett Canyon. Don’t forget to click on each picture to enlarge them; you don't want to miss any of the beautiful detail. We are so fortunate to live in such a gorgeous place! Quilters have always stitched with the language of love and caring. We share our passion with those we love and strangers alike. We have a generosity of spirit that will live for generations to come. What better way to honor us than to bring and meet all your friends at Patchwork Quilts on WORLDWIDE QUILTING DAY, Saturday, March 19th. Don't forget your friendship star block!